Although PowerPoint presentations are usually displayed on a screen, they are just like other documents in the Microsoft Office suite such as Word, Excel, and Publisher. Just like those other applications, you can add custom headers and footers to a PowerPoint presentation to display a variety of important information. Why Display Headers and Footers in PowerPoint? There are three main reasons to display headers and footers in a PowerPoint presentation. First, headers and footers let you display recurring information on your slides to help your audience keep track of your presentation’s content. Most popular is the use of page or slide numbers. Second, headers and footers can help keep you on track during the presentation. No matter how well you prepare for a presentation, it never goes exactly as planned. Interruptions, questions from the audience, and going off on a few tangents are just a few of the reasons you may need to jog your memory of where you are in the presentation and what to present next. Finally, headers and footers can help keep your name in front of the audience. Many people like to print the PowerPoint presentations they get. By putting your name in the corner of key slides, you can be sure your audience won’t forget who you are. Adding headers and footers to PowerPoint slides is a bit different than adding them to a Word document. The reason is because where the header and footer shows up depends on the theme you chose for your presentation. For illustrative purposes, we will use the Civic theme, one of the more popular designs that ships with PowerPoint. You may need to experiment to get the headers and footers you add to your PowerPoint presentation to look the way you want them. Luckily, the options available for all the themes when it comes to headers and footers are all the same. Once you have your theme selected, click on the Insert tab on the Ribbon and locate a section of the Ribbon labeled Text. Then, click on the button titled Header & Footer. This will open the header and footer options window. You’ll notice right away that adding headers and footers to a slide is quite different than in other applications. First, notice that you do not have direct control over what is displayed in the header. 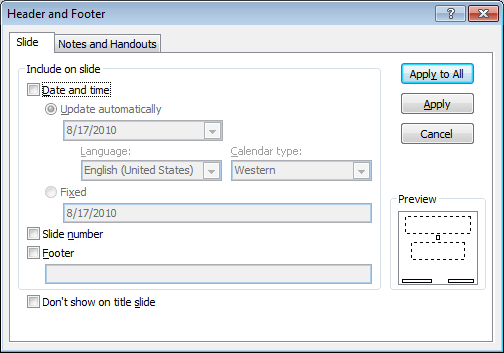 For that area of the slide, you can choose to insert a dynamic date, a fixed date, or a slide number. By checking the Footer option, you can add any text you want. However, notice that when you insert your header and footer into a PowerPoint slide, the information in those areas does not show up where you might expect. The header appears on the bottom right, the footer at the bottom left, and the page number is in the circle on the Civic-themed slide. Second, you can apply the header and footer to just the current slide by clicking the Apply button or you can apply them to every slide by clicking on the Apply to All button. This makes it much simple to add custom header and footer information on the slides as you want them. Also, notice that you can select the Don’t Show On Title Slide option to remove the header and footer from the first slide in your presentation. There are two tabs near the top of the window. So far, we have been working on adding a header and footer to the slides themselves. You can also apply a different set of headers and footers to the Notes and Handouts of your presentation. This is useful for keeping the slides you use on the screen as clean as possible while adding information to the notes and handouts, which are often printed on paper for you and your audience. 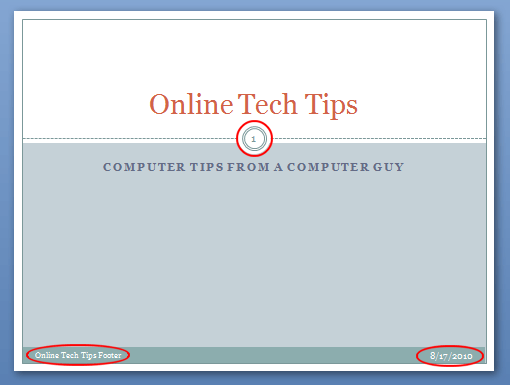 Where the header, footer, and page numbers end up on your PowerPoint slides depends on the theme you have chosen. However, once placed into the slides, they can be moved around just like any other text box in your presentation. Leaving them where they are by default creates a neat and professional appearance, however, so be careful about moving them around because you will have to reposition them by hand on every slide. This can create a messy appearance as you cycle through the slides of your presentation if they are not perfectly positioned from slide to slide.